A quick post today to share some cards I made recently. I recently started to get more confident colouring in stamps and then fussy cutting them out. I’ve also been playing more with my watercolours. 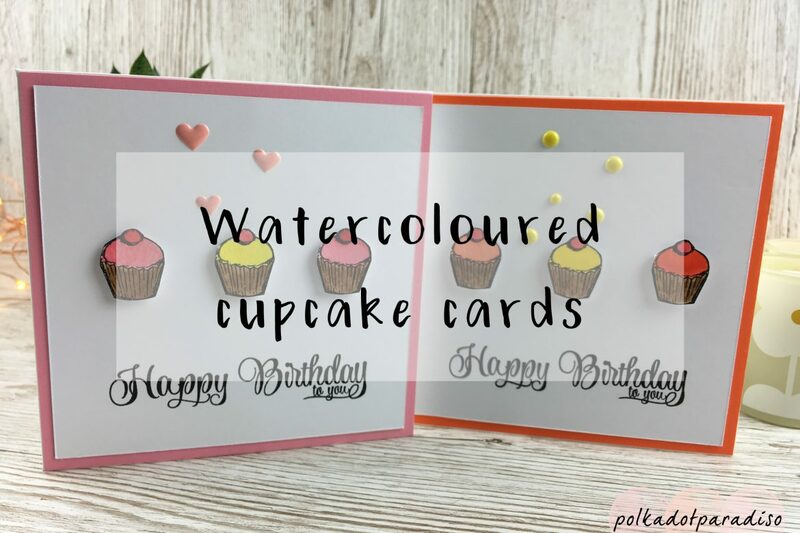 When I needed to make some quick cards this past weekend, I put the two together and recreated my cupcake card, but used watercolours instead. This was such a quick make but it turned out really nicely. I love the added pop of colour in the border and the enamel shapes just finish the card off perfectly. I am now on the lookout for other stamps to use to create similarly styled cards. You can also really easily adapt this for Christmas cards. Christmas trees, presents or stockings would all work great for this kind of card. Finished off with My Minds Eye wooden dots and a nice red border, you’ve got some nice quick Christmas cards. Have you started your Christmas Cards yet? It’s on my to do list, though I’ve yet to make a start on them! Please note this post contains affiliate links, they don’t cost anything to follow but do help support the blog!